The Lorraine Building, an extended-stay hotel constructed in 1891, was located at 201 West Washington Street. The location was incredibly desirable even from the beginning, because of its proximity to the current State House (completed in 1888) as well as being on the National Road, also known as Washington Street and U.S.-40. The National Road was incredibly important for early Indianapolis business and commerce. Prior to construction, the location was used as “State Offices,” presumably during the shuffle of governmental offices during the construction of the fourth and current State House. 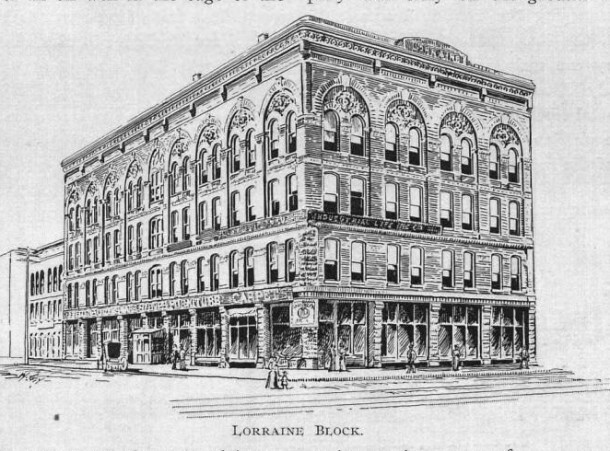 The Lorraine Hotel had the same footprint as the 1887 State Office building except for the façade set back was slightly closer to the street on the Washington Street side. Was part of the former structure used in the construction of the Lorraine? One may never know for certain, as the building was demolished in 1967. The area, so centralized to downtown, was extremely built up before construction began on the Lorraine. 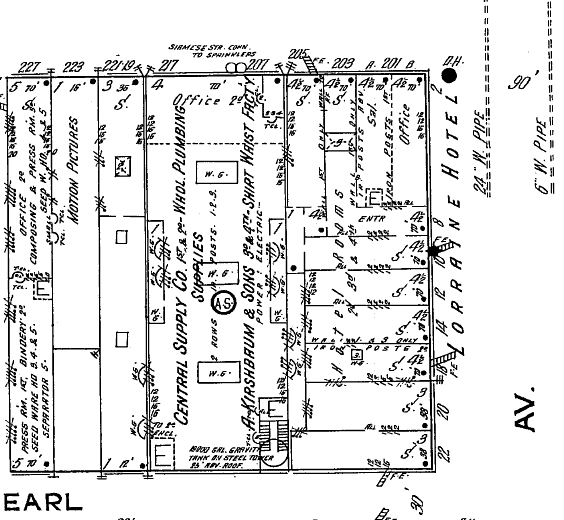 In 1887, the prime location was home to a Masonic Lodge and the Grand Lodge Hall across the street, Capitol Avenue (then called Tennessee Street), from the future Lorraine. There was also a large carriage manufacturer business by name of A.A. Heifer & Son just to the south; there were still many duplex homes around the area as well. Just ten years later, the area had evolved into more manufacturing and businesses and less dwellings. 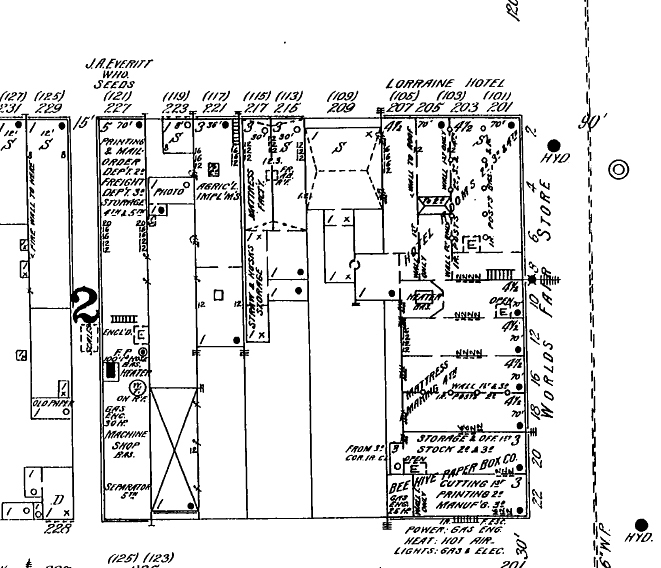 This included the addition of the Bee Hive Paper Box Company and a mattress making company inside of the Lorraine as well as the Capitol City Buggy Company just to the south of the building. To the northeast were the Park Theater and the Bates House. 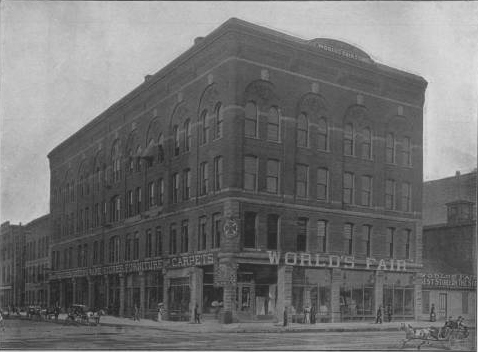 Due to the massive popularity of the 1893 World’s Fair: Columbian Exposition in Chicago, most of the first floor shops in the Lorraine were occupied by a large World’s Fair Store for most of the 1890’s. The Lorraine Hotel was troubled throughout its existence with gambling, prostitution, and even death. An early proprietor, William Beck, was arrested in 1903 for running a gambling room in part of the saloon (“Proprietor of Lorraine Refused to Give up Keys,” IndyStar 11/30/1903). These common gambling raids continued for years, targeting the Lorraine and other downtown apartment hotels. In 1905, Beck and several other gamblers were convicted of playing “craps,” and Beck was additionally fined $100 (“Gamblers Fined in Police Court,” IndyStar 10/13/1905). A string of suicides began the following year, with the wife of a business man, James Ross of Pennsylvania and Pearl streets, killing herself before her husband could divorce her (“Bride Commits Suicide,” IndyStar 9/5/1906). Beyond the questionable behaviors that went on in the hotel, the hotel thrived due to its central location. The International Association of Bridge and Structural Iron Workers used the hotel during their convention stays: “One square west, and opposite the State Capitol, is the Lorraine Hotel, which has been selected as headquarters during the convention. While within one block of the heart of the city and but four blocks from the convention hall, the delegates will find the Lorraine a quiet, home-like place and the manager, Mr. S.C. Williams, will do everything in his power to please his guests.” (The Bridgemen’s Magazine, Volume 7, 1907) Many advertisements focused on the convenience of being near the State House, describing the Lorraine as “opposite State House and best equipped European hotel in Indianapolis. 50 cents and upward, $1.50 with bath.” (Advertisement, IndyStar 9/15/1908) Another ad was more specific: “cozy, comfortable, sumptuously appointed, modern throughout. Centrally located. The best accommodations of any strictly European hotel in Indianapolis. One hundred guest chambers, fifty with private bath. Commodious suites for families. Rates extremely moderate – 50 cents, 75 cents, and $1.00, $1.50 with bath.” (Advertisement, IndyStar 11/29/1909) The hotel was also two blocks away from Interurban lines and Union Station. The success of the hotel lead to its interior makeover in 1910 – at the price of $15,000. 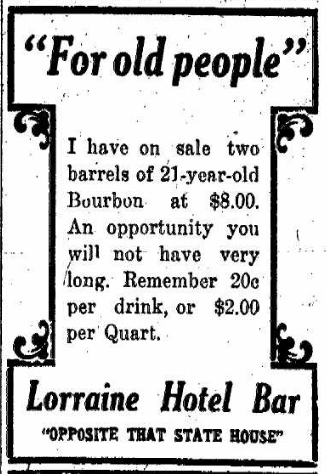 Renovations included new plumbing, hot and cold water equipment, local and long distance telephone connections, new furniture, new lighting, and a new décor scheme for the barroom (“Improves Lorraine Hotel,” IndyStar 10/6/1910). 1912 was a busy year for the Lorraine. Over 150 veterinarians from Indiana came to the hotel for preliminary sessions for the Veterinary Examining Board; the two day event held examinations by the Indiana Veterinary Medical Association in the State House nearby (“Veterinary Board Meets,” IndyStar 1/9/1912). Another interesting tale is that of Ortie E. McManigal, an accomplice to the brothers John J. McNamara and James B. McNamara who bombed the Los Angeles Times building with dynamite in 1910 (“McManigal May Remain as Aid,” IndyStar 1/30/1912). McManigal cut a deal with authorities by confessing everything he knew about the Iron Workers Union attack, which was incited by union-busting tactics employed by many executives, including the publisher of the Los Angeles Times. McMangial testified in multiple dynamite-related trials as an expert in Indianapolis and Los Angeles. 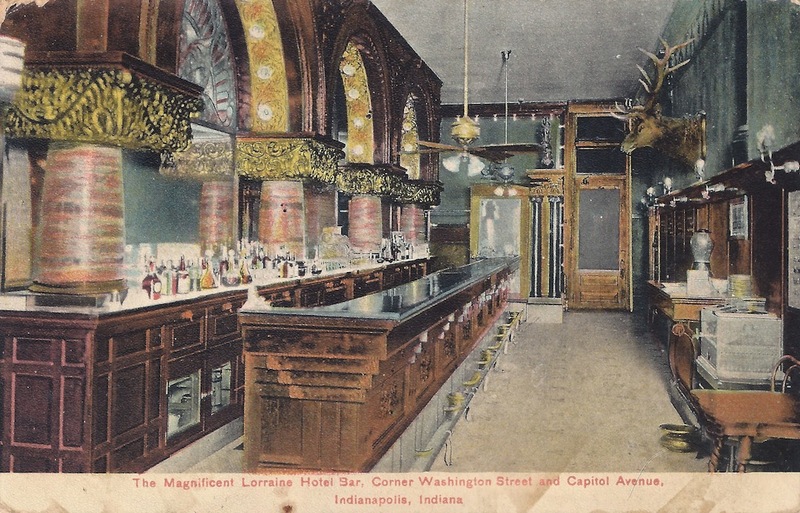 He had stayed in the Lorraine for some time before the investigation; proprietor Charles Muellerschoen and clerk Floyd Thompson testified to McManigal’s Indianapolis visits. Later that year, Mrs. Julia Merrill Moores died at her home, 2020 North Pennsylvania Street. Referred to as the “most elderly native of Indianapolis,” the daughter of State Treasurer Samuel Merrill was born at the Old State Treasury House in 1826 – the location of the Lorraine Hotel years later (“Mrs. Julia M. Moores Expires at Age of 86,” IndyStar 4/7/1912). Her father also was the first president of State Bank, first president of Madison & Indianapolis railroad, and founder of Bobbs-Merrill book store. Mrs. Moores was a founder and board member of the Home for Aged and Friendless Women, and also a member of the Fourth Presbyterian Church and the Women’s Club. What did Mrs. Moores think of the evolution of her birth street? By 1914, much had changed in the Lorraine building. The World’s Fair store had long moved out. Renovations were complete. On Washington Street, the first floor was divided into four store fronts; there were six store fronts on the Capitol Avenue side. Just to the west of the Lorraine was an equally-sized building that housed the Central Supply Company Whole Plumbing Supplies on the first and second floors and the A. Kirshbaum & Sons Shirt Waist Factory on the third and fourth floors. 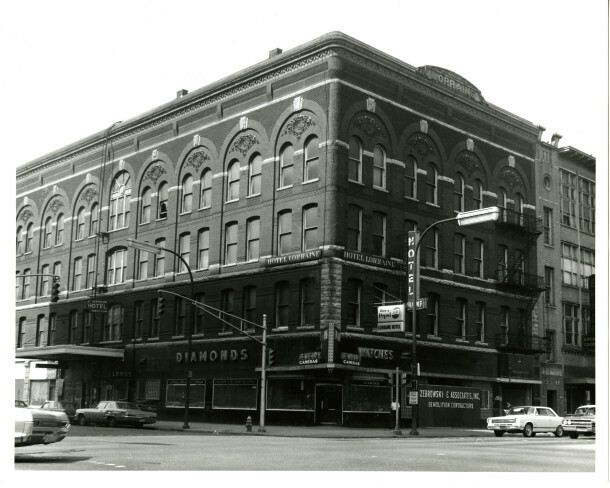 D. Sommers & Company Furniture & Household Furnishings moved across the street into Masonic Temple. Prices had risen in the building, with two and three-room suites going for $6.00-$8.00 (Advertisement, IndyStar 7/5/1914). 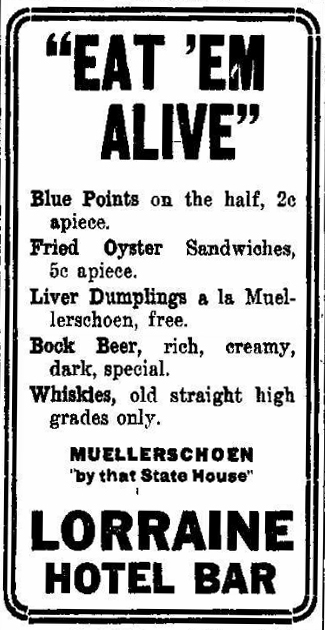 Raids began again when in 1917, proprietor Charles Muellerschoen was arrested for selling liquor to soldiers and “permitting them to rent room for immoral purposes.” (“Lorraine Raid Paves Way for Hotel Vice Cleanup,” IndyStar 11/26/1917) The following month Muellerschoen was arrested for “operating an immoral resort,” specifically stating that he had sold liquor to soldiers and organized prostitution in the building (“Hotel Proprietors Take Note, Col. Harrison Says,” IndyStar 12/17/1917). The following year, Clara Muellerschoen filed for divorce from her husband – no doubt the liquor and prostitution related arrests played a part (“Says Husband is Disloyal,” IndyStar 5/9/1918). Five months later, Charles Muellerschoen killed himself in his room at the Lorraine (“Uses Shot Gun and Ends Life,” IndyStar 10/3/1918). 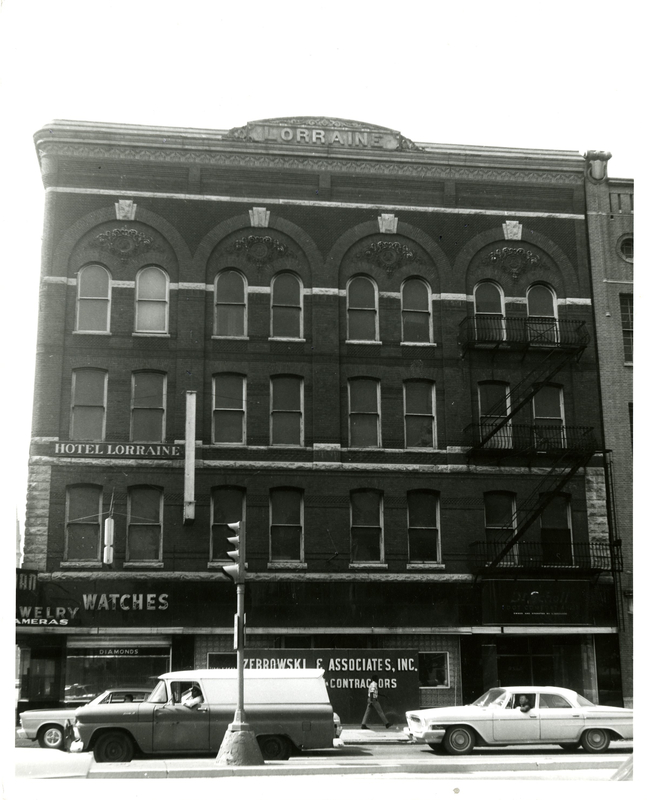 In 1919, the Lorraine building was capitalized at $20,000 – the leasing company, Washington-Capitol Realty Company, argued with the owners, Mr. and Mrs. Joseph C. Schaf, on demolishing the building to construct a larger hotel (“$15,000 House is Being Built,” IndyStar 7/30/1919). It was becoming more and more difficult for the Lorraine Hotel to compete with such bigger and newer accommodations. The construction idea was rejected by officials of the company. Gambling problems resurfaced in the hotel four years later: Glenn Mitchell, billiard room proprietor, was arrested for running a gambling house (“Four Held for Gaming and Two on Rum Counts,” IndyStar 1/29/1923). The hotel’s days were numbered, as the 1950’s brought about surface parking lots, less manufacturing downtown, and suburban sprawl. Just to the southeast and also an entire quadrant southwest of the Lorraine had been demolished for surface parking lots. In 1967, plans were established for Zebrowski and Associates, Inc. to demolish the Lorraine Hotel for a surface parking lot. The location was intended for the mall of the Indiana Convention-Exposition Center, but the funds were not included in the estimate for the Convention Center at the time (“Lorraine Razing to Begin,” IndyStar 5/25/1967). Currently, the location is the Simon Property Group World Headquarters. The Lorraine Hotel was a simplified yet elegant mix of Renaissance Revival and Romanesque Revival. 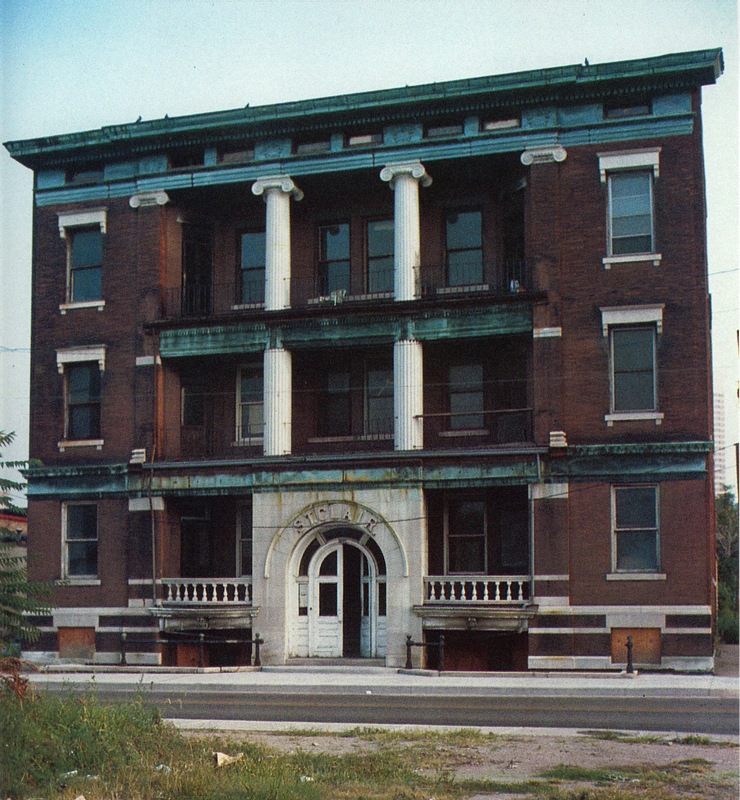 The building – designed by architect Robert Platt Daggett – had a very interesting textured brick pattern below some windows and some also acted as stringcourses. There were large, shallow arches with keystones around the windows of the third and fourth floors. 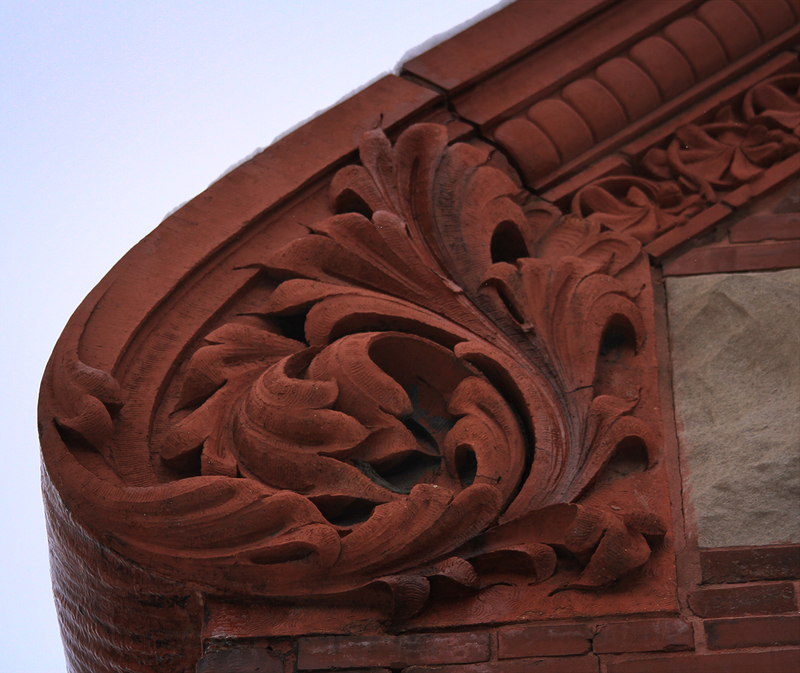 Inside the top of the arches were stone carvings topped with a floral motif. 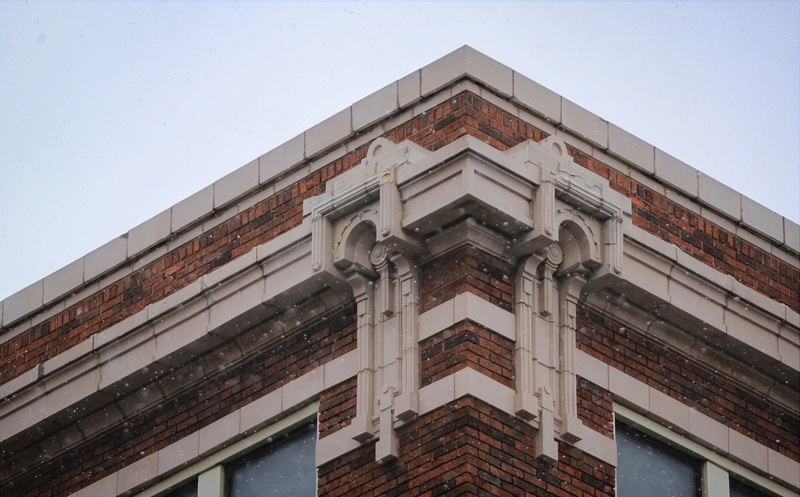 The name “Lorraine” was inscribed in limestone on top of the cornice on the Washington Street side. There were distinctive divisions to the façade. The building had stringcourses below the second and third floor windows, as well as intersecting and above the fourth floor windows. The cornice was extremely detailed and elaborately carved. The first floor and sections of the second floor had rusticated stonework. The building was quite refined in details down to the simple curvature of the corners of the exterior. The first floor was divided into ten stone fronts, and the remaining three floors were hotel rooms with twelve foot ceilings. There were wide, ten foot halls and fire escapes on each floor (Advertisement, IndyStar 10/13/1910). Despite the unique history and architecture, no protections were ever awarded to the structure which in turn led to its demise. Prior to its destruction, I believe I ate in a restaurant that was located on the Washington Street side, and later, upon being inducted into the US military, the “Induction Station” was located adjacent to, or in the building, facing Washington Street. I think it was a next door building, because it was still in that location after 1967, when the Lorraine was demolished. The “draft board” was located in the Wulsin Building on East Ohio Street. I visited there before and after my tour of duty ,as required. Enough about me! Very interesting! I enjoy your stories, Basil! Interestingly enough, suicide victim Charles Muellerschoen was buried in Section 54 Lot 1578 on October 4, 1918. That particular section was used for individuals who could only afford to buy one grave and the lots were more or less used in the order in which the burials took place. So about half the people buried in his vicinity that fall were victims of the 1918 flu epidemic. Thanks for the facts, Tom! I would love to see more cemetery-based history on here, wouldn’t you? Great job as usual Jordan! I used to work catty corner from this building at One North Capitol and always used to wonder what sat on this site. This is getting to be one of my favorite features. BTW, if you would be interested in doing a feature sometime on the Atlas Hotel (further east on Washington Street) I would be glad to send some information to you on it. 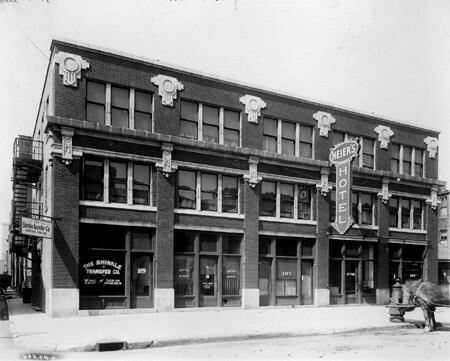 The “Danube” restaurant and lounge, which would have been located in the center of the building’s ground floor, was a hangout for many of the staff of the Indianapolis Times. I wonder if that would have been the same location inside the building as the Hotel Bar?